CNC Surface Grinding Services | CNC Machining | KLH Industries Inc.
KLH provides precision CNC surface grinding services for the most demanding projects. KLH grinds high tolerance parts to a mirror-like surface finish, while meeting flatness, parallelism, and squareness requirements. Typical tolerance, but can vary due to material properties. Maximizes cutting efficiency for different wheel and material types. Entire work envelope covered by variable electromagnetic chuck. Multiple CNC grinding passes can create a smooth, mirror-like finish. Typically for metals and alloys, as parts are held down magnetically. Multiple hand-operated machines for form grinding or fixture grinding. CNC surface grinding is most proficient at producing tight tolerances and mirror finishes on flat, square, and parallel surfaces. Using form grinding (shaped wheels) or fixture grinding can achieve curved or angled geometry. A common application of CNC grinding is die sharpening, as it removes only the necessary material to produce a sharp edge. Tolerance and surface finish are most affected by material type of both the part and the grinding wheel. KLH stocks a variety of wheels for grinding stainless steel, carbide, polycrystalline diamond (PCD), and most other metals and alloys. CNC surface grinding is most easily performed on ferrous materials, as parts are held down magnetically. In other circumstances, a non-magnetic part may be clamped down if it does not interfere with the path of the wheel. CNC surface grinding removes small amounts of material by using a high-speed abrasive wheel as the cutting tool. The grinding wheel rotates in place, while the work piece, attached to the machine table, moves in the X-, Y-, and Z-axis. Depending on the part size, the grinding wheel will likely take multiple passes to achieve the desired dimensions. 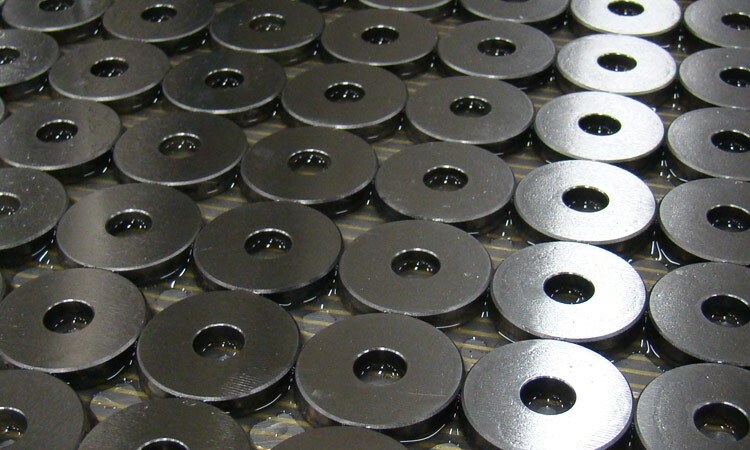 Do you offer CNC grinding services for plastics? Not at this time, plastics tend to gum up the grinding wheel. Do you provide blanchard, inside diameter (ID), or outside diameter (OD) grinding? Not internally at this time, but KLH has a history of project managing these services through qualified vendors. KLH ensures that features/requirements are flowed down to the vendor, and the CMM inspection department is more than capable of verifying dimensions produced by grinding services.